Setting a passcode on your iPhone is the first line of defense to help prevent other people from accessing your device. 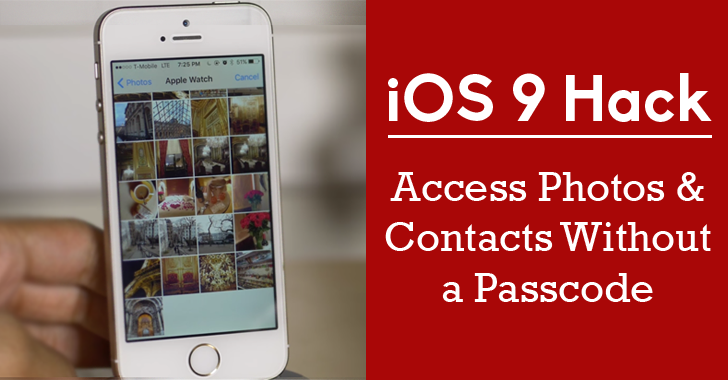 However, it's pretty easy for anyone to access your personal photographs and contacts from your iPhone running iOS 9 in just 30 seconds or less, even with a passcode and/or Touch ID enabled. A hacker has found a new and quite simple method of bypassing the security of a locked iOS device (iPhone, iPad or iPod touch) running Apple's latest iOS 9 operating system that could allow you to access the device's photos and contacts in 30 seconds or less. Yes, the passcode on any iOS device running iOS 9.0 is possible to bypass using the benevolent nature of Apple’s personal assistant Siri. Wake the iOS device and Enter an incorrect passcode four times. For the fifth time, Enter 3 or 5 digits (depending on how long your passcode is), and for the last one, press and hold the Home button to invoke Siri immediately followed by the 4th digit. After Siri appears, ask her for the time. Tap the Clock icon to open the Clock app, and add a new Clock, then write anything in the Choose a City field. Now double tap on the word you wrote to invoke the copy & paste menu, Select All and then click on "Share". You can also watch a video demonstration (given below) that shows the whole hack in action. It isn't a remote flaw you need to worry about, as this only works if someone has access to your iPhone or iOS device. However, such an easy way to bypass any locked iOS device could put users personal data at risk. Until Apple fixes this issue, iOS users can protect themselves by disabling Siri on the lock screen from Settings > Touch ID & Passcode. Once disabled, you’ll only be able to use Siri after you have unlocked your iOS device using the passcode or your fingerprint.